We propose a new approach to compute counterexamples for violated ω-regular properties of discrete-time Markov chains and Markov decision processes. Whereas most approaches compute a set of system paths as a counterexample, we determine a critical subsystem that already violates the given property. In earlier work we introduced methods to compute such subsystems based on a search for shortest paths. In this paper we use SMT solvers and mixed integer linear programming to determine minimal critical subsystems. 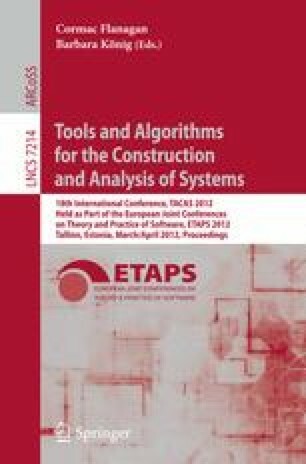 This work was partly supported by the German Research Council (DFG) as part of the Transregional Collaborative Research Center “Automatic Verification and Analysis of Complex Systems” (SFB/TR 14 AVACS) and the DFG project “CEBug – Counterexample Generation for Stochastic Systems using Bounded Model Checking”.